What’s Restraining Your Growth? - The AIM Institute What’s Restraining Your Growth? Your Time Horizon. The AIM Institute > Insights > Blog > Customer Insights (VOC) > What’s Restraining Your Growth? Your Time Horizon. What’s Restraining Your Growth? Your Time Horizon. When I was a freshly-minted chemical engineer, my first job was night-shift foreman overseeing a nitrile rubber extruder. Every hour I would take a sample coming out of the extruder die to make sure it was within specification. If it was out of spec, did I stand at the extruder die and exhort it to do a better job? Of course not. I examined the raw material going into the feed hopper, and I checked the horsepower and heat going into the drive screw. Extruder Die: This represents your financial results. 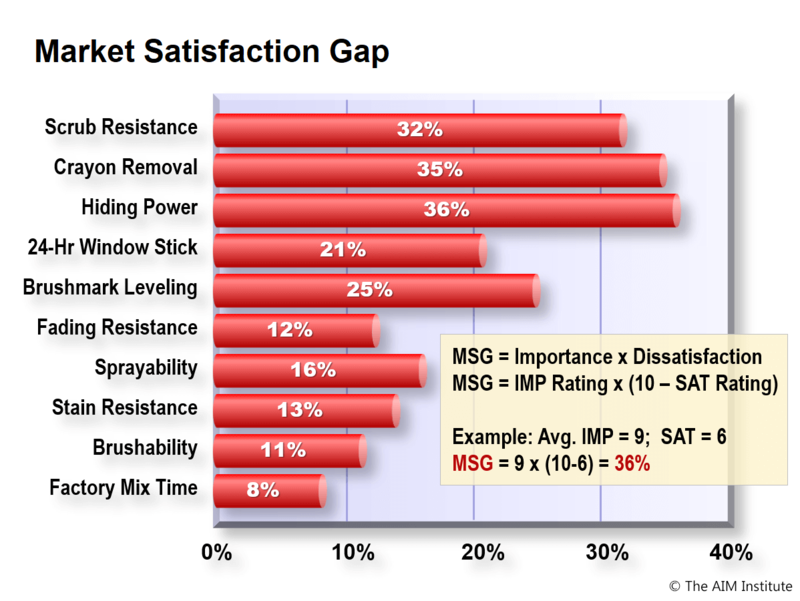 High rate & quality from the extruder die correlates to top-line growth and profitability in your business. Feed Hopper: Unbiased, unfiltered insight into customers’ needs is critical. @aim_institute. You simply cannot extrude good product with defective raw material. Drive Screw: Serious horsepower is needed to transform raw material into high-value product. You need skilled, focused people to “power” your innovation. During financial review meetings, you’re looking at the extruder die output. But for what purpose? If the goal is simply to improve this quarter’s financial results, you have a time horizon problem. 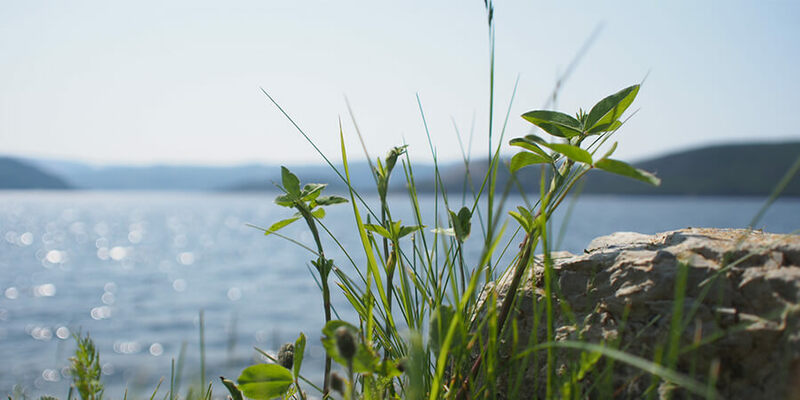 There is little you can do this year to impact profitable, sustainable growth this year. There is little you can do this year to impact profitable, sustainable growth this year. What comes out of your extruder die today entered the feed hopper years ago. What you did 3-5 years ago has a huge impact today. What you do now has little impact today. The more time you give yourself, the longer your lever. And long levers are good for moving something big… like your company. Sure, you can take actions this year to impact financial performance this year… but they may well detract from profitable, sustainable growth overall. If you want to keep battling growth and profitability crises every quarter for the rest of your career… obsessing with financial reviews is just the way to spend your time. 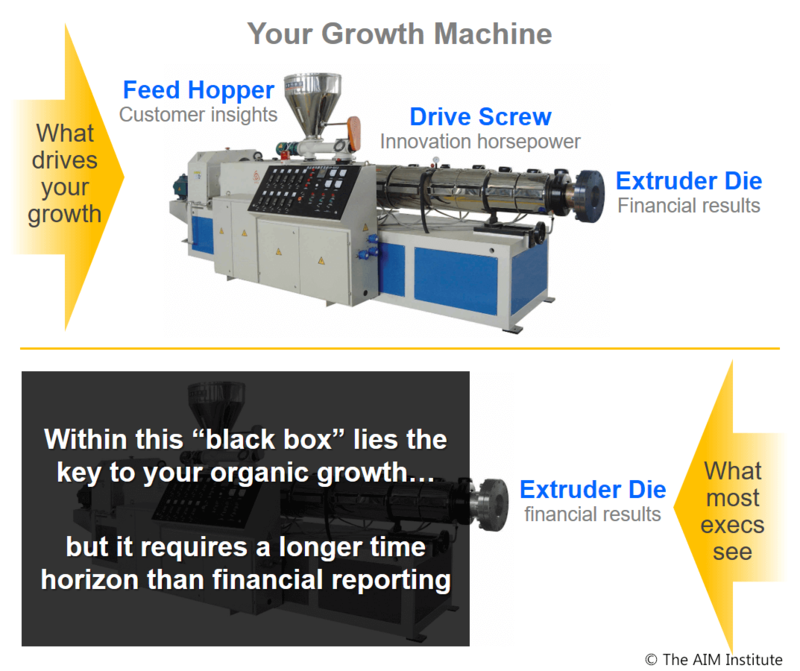 For serious growth, you can’t treat your growth machine like a “black box.” You must examine what’s really going on inside. @aim_institute. Beyond project reviews and R&D budget talks, much closer examination is needed… especially concerning capabilities. This means the teams would have developed a different product without these interviews. Their products would have suffered errors of omission (overlooking customer outcomes) and errors of commission (focusing on the wrong outcomes.) In other words… defective raw material into the feed hopper. I’d ask business leaders for their growth machine repair plan. What would you do if you were the CEO? Hope your direct reports fix their feed hoppers and drive screws? I wouldn’t. If they weren’t already showing strong, reliable growth, I’d ask business leaders for their growth machine repair plan. If this seems overbearing, remember your fiduciary duty isn’t to win quarterly battles on the way to losing the war. Financial reports won’t tell you if a business is eating its seed corn or preparing for a bountiful harvest. To your accounting system, $100K of innovation training looks the same as a $100K boondoggle. So you must get inside the growth machine to see how it operates, not just what comes out. Your repair plan should start by eliminating R&D based on assumed customer needs. Here’s how: During Preference interviews, customers give 1-10 ratings for importance and satisfaction on key outcomes. They’ll only pay a premium for products that satisfy outcomes both important and unsatisfied today. Such outcomes have a Market Satisfaction Gap of 30% or more. This tells you precisely what your R&D should work on. New Product Blueprinting is all about the feed hopper: B2B customer insight. But it’s not enough. Customer insight is necessary, but not sufficient. You can forget about real growth if you lack the horsepower to convert customer needs into innovative products. What does real innovation horsepower look like? Teams are motivated to succeed as a team. They have mastered innovation skills and tools. They devote enough time to rapidly advance their project. This type of innovation horsepower is rare. 1. Available time: Since the Great Recession, we see fewer people doing more work. I sometimes ask workshop attendees, “What did your boss take off your plate so you could learn these new skills?” Always good for a chuckle. The “tyranny of the urgent” hinders important progress. Even if team members devote enough time “on paper,” they often lack the flexibility to act when the task requires attention. Research by Michael George (Fast Innovation, p. 55) indicates lead times are four times as long for those at 95% capacity utilization vs. 65%. 2. Required skills: Too many teams work inefficiently. Companies that invest to improve manufacturing productivity often lag in training to improve innovation productivity. As a result, teams use out-of-date voice-of-customer methods… develop customer-reactive products instead of market-proactive ones… leave money on the table when pricing, etc. 3. Team motivation: Instead of true teams, many are just meetings of “emissaries visiting from foreign functional areas.” Teams that drive innovation share these traits: a) Management clearly signals this is a top priority, b) the team leader is highly-capable and enthusiastic, c) team success impacts personal performance reviews, and d) team members are excited about being part of this team. Does your organization exhibit this kind of attention deficit disorder? 4. Organizational disruptions: Many teams begin with high hopes, only to be frustrated by organizational turmoil. A travel ban causes confusion as to which trips are authorized. Spending freezes delay important work. The latest reorganization creates uncertainty until the “dust settles.” New initiatives overshadow or kill the team’s project. Key team members are given new assignments. Does your organization exhibit this kind of attention deficit disorder? If so, it’s not going to see the smooth and efficient transformation of customer insight into customer value. First, this is something you can control. These problems can be fixed by a leadership team that moves beyond the extruder die into the black box. Unless your leaders are just in this for their short-term personal gain—uncommon in my experience—there is hope. Third, the problem is so severe today that even modest repairs will work wonders. Some research indicates half of R&D is squandered on failed projects. With proper customer insight, you might double your R&D productivity. Bottom line: Don’t spend R&D resources unless you know they’re only pursuing outcomes customers care about. You probably have time to pull ahead of your competitors. Fourth, you probably have time to pull ahead of your competitors. At The AIM Institute, we have a broad perspective that comes from working in nearly every imaginable B2B industry around the world. We have yet to see a firm that was already getting this right. If your company is willing to adopt a longer time horizon, it can build a machine that will drive profitable, sustainable, organic growth. @aim_institute. Instead of engaging in a spectator sport at the extruder die, you’ll be making a difference in a participant sport. The “future you” will thank the “you” reading this now.